AEAI is USAID’s implementing partner for the Sheberghan Gas Generation Activity (SGGA), which provides technical assistance, training, and project support to USAID’s initiative with the Government of the Islamic Republic of Afghanistan (GIRoA) known as the Sheberghan Gas Development Project (SGDP). SGDP’s primary goal is to promote the development and use of domestic fuel sources to reduce the need to import fuel and electricity, while stimulating economic growth for 1.6 million Afghans. Additionally, SGDP aims to support private sector investment in the energy sector resulting in generation of more reliable electricity and development of domestic sources of gas. 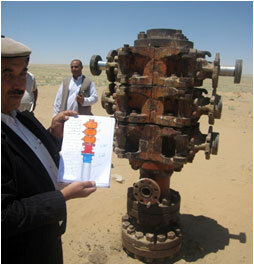 The project's components are: 1) it assists the Afghan Ministry of Mines and Petroleum (MoMP) to assess the natural gas reserves in two underdeveloped natural gas fields in northern Afghanistan; 2) it supports the development of a 200-megawatt (MW) gas-fired power plant to be supplied from the Sheberghan gas field, structured as Afghanistan’s first Independent Power Producer (IPP); 3) it supports strengthening natural gas sector policy, legal and commercial foundations to enable private investors to build and operate the IPP; 4) it supplies geological data that may assist in attracting commercial investment in the northern gas fields; and 5) it aims to increase the capabilities of the national utility to distribute electricity to northern region customers. To MoMP to: 1) select and manage drilling and engineering firms to carry out the gas reserves assessment; 2) construct a gas transportation and processing facility, and improve MoMP’s capabilities to oversee and operate the gas fields, with the end goal of building a sustainable, self-sufficient, and commercially viable business organization that will continue to develop Afghanistan’s substantial natural gas resources beyond SGGA. To DABS, the corporatized Afghan national utility, in preparing, and negotiating and implementing natural gas supply and power purchase agreements – the first of such commercial agreements in Afghanistan. To MEW, to create policies and regulatory structures to encourage private investment in the IPP and future power projects. Establishing project oversight and quality control procedures and structures for the upcoming gas field development projects. Comprehensive capacity building programs in business and technical areas for MoMP and MEW have been developed and are being implemented on an ongoing basis, including a capacity building program to assist MoMP in the operations and maintenance of assets acquired for the SGDP. MoMP development – supported by SGGA – of tenders and procurements for gas-well rehabilitation, a new gas well drilling project, and drilling supervision (related to confirming natural gas reserves). Enhanced understanding of the technical and commercial aspects of gas-to-power transactions by MoMP, MEW, and DABS, which includes pricing and risk models and contract negotiation and management of gas and power sales/purchase agreements. Support to MoMP in learning how to plan for continued gas field development using internationally recognized contracting and business strategies. Joint trainings for DABS and MEW’s planning departments and for DABS’ National Load Control Center. Gathering extensive data and evaluating the technical and commercial sustainability of DABS’ operations in Balkh Province, with particular emphasis on the effect of including power generated from the proposed 200-MW Sheberghan IPP. Gas market analysis report for the Ministry of Mines and USAID detailing potential for the commercially sustainable use of natural gas produced in northern Afghanistan. Northern region industrial development feasibility study and projections based on increased gas and power supplies created by the project. Project environmental assessments for USAID and environmental permitting by the Afghan National Environmental Protection Agency.